I’ve been on a major Harry Potter binge-fest lately. I recently re-read all of the books and just made my way through all of the movies again. I’m also looking forward to seeing Fantastic Beasts: The Crimes of Grindelwald next week. As much as I’d love to go on opening night, I don’t do well with crowds. I’ll pick a day when everyone else is at work! If you’re as crazy for Harry Potter and the entire Wizarding World as I am, you’ll love these hoodies! 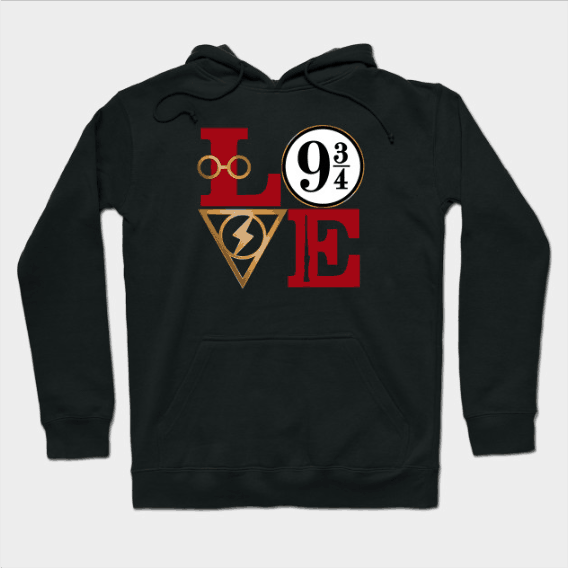 They also make great holiday gift ideas for Potter-obsessed family and friends! This post contains affiliate links. If you make a purchase through these links, I earn a small commission at no extra charge to you. Thanks for your support! There are a few different Leaky Cauldron Hoodies on TeeLaunch, but this one is my favorite (by a close margin). It comes in 6 different colors, although I prefer it on the dark blue background. Makes the yellow stand out more. This is one of my all-time favorite Dumbledore quotes, and I think this hoodie perfectly captures the meaning behind it. It’s high up on my holiday wish list! Pretty much the most popular quote from Harry Potter and the Prisoner of Azkaban, I think we would all solemnly swear that we are up to no good if it meant tracking our friends and family on a secret map! Okay, that sounds a bit creepy, lol. Isn’t this a gorgeous visual for the Tales of Beedle Bard Three Brothers story? If you recall, Three Brothers explains how the Deathly Hallows (the Elder Wand, the Resurrection Stone, and the Cloak of Invisibility) came to exist. Which one would you pick? Me? I’d take the Cloak of Invisibility! 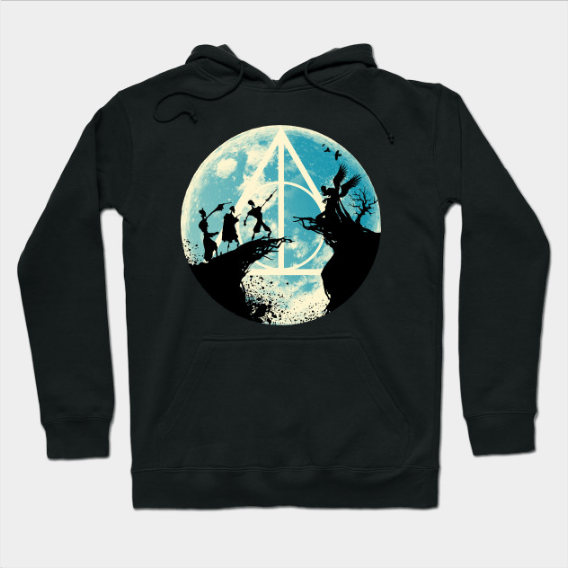 Okay, the title of this shirt has a spelling error (as in word spelling, not spell spelling) on the site, but it’s still one of my favorite Harry Potter hoodies. It features most (if not all) of the spells used throughout the books by the main characters. It comes in 6 colors, but I like it either on red or royal blue. Luna is one of my favorite characters after Harry, Ron, and Hermione. She’s not afraid to be herself, even though it makes her the victim of bullying and teasing. People steal her stuff, call her “Loony,” and dismiss her ideas without even listening to them, but she still keeps on being Luna. The artist calls this “pop art meets fandom,” which sounds about right. It brings together all of the major elements of Harry Potter, from Platform 9 3/4 to Harry’s glasses and, of course, his lightning bolt scar. It comes in 4 colors but looks best on black or navy. I love this hoodie so much! I perfectly captures the magic that can be found not just in the Harry Potter series, but inside books in general. I’ve always felt better surrounded by books because I feel like hundreds of intriguing little worlds are within my reach at any given time. 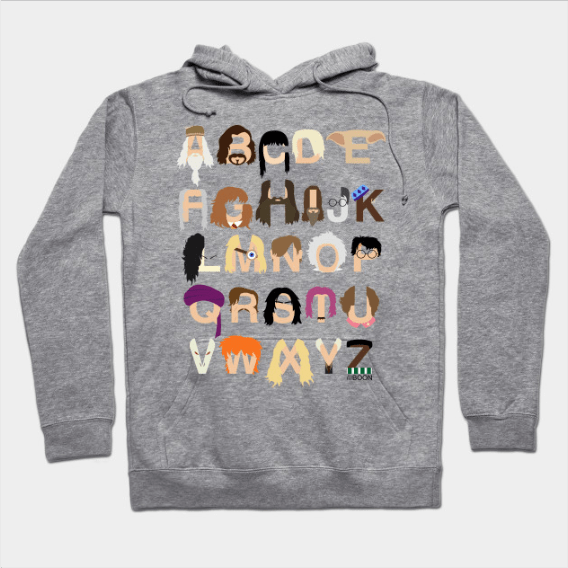 How cute is this Harry Potter Alphabet hoodie? Each letter represents a different character or element from the book. How cool is this Marauders word art hoodie? It’s made up of the names (both real and in animal form) of the original creators of the marauders map along with some other great quotes. 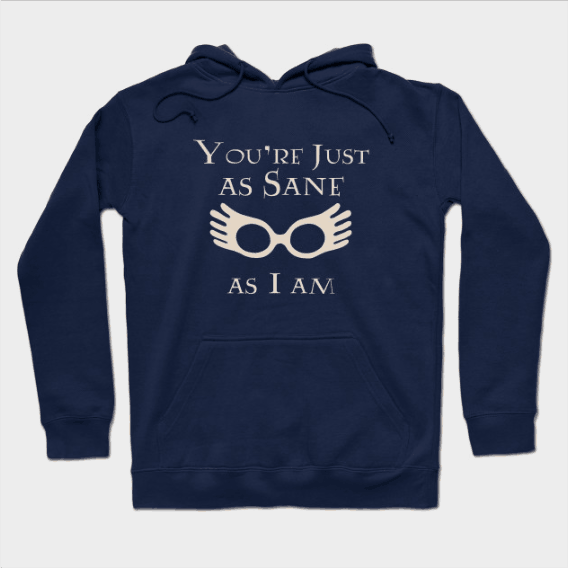 Another one for Luna Lovegood fans! 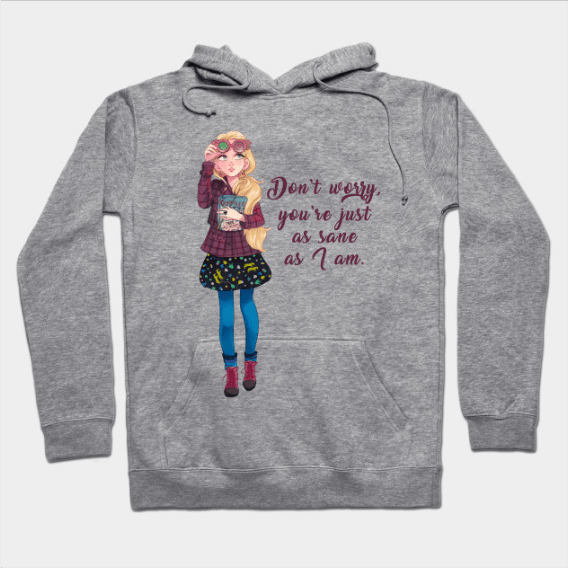 Same quote as the hoodie above, but different style. I couldn’t choose between the two, so I added both! Books make the mundane exciting, chase away boredom on a rainy day, and give us a reason to stay up past our bedtime. They also turn muggles into wizards! Live by this motto and you’ll get along just fine in life! Well, maybe you want to skip the Eat like Weasley part if you don’t have Ron’s obviously fast metabolism! Words are one of the most powerful forces in our world and most certainly an inexhaustible source of magic! This one would make the perfect gift for writers! So true! So very, very true! I absolutely need this one, I’m riddikulus-ly obsessed with Harry Potter and the entire Wizarding World. How about you? This one comes from a line Ron said to Hermione in The Sorcerer’s Stone: “You’re a little scary sometimes, you know that. Brilliant. But scary.” I think we should all strive to be as brilliant (and scary) as Hermione! These last three are for Fantastic Beasts fans! The Niffler is my favorite beast. He can steal my valuables any time! Although, he’d be a little hard-pressed to find any, lol. I don’t exactly drip with diamonds. I think this Fantastic Beasts Monster Suitcase hoodie is just so beautifully done. I love all the colors! The artist, penelopeloveprints, is very talented! Forget American Horror Story, I’d rather watch the American Auror Story! How about you? If you’re looking for more Harry Potter hoodies, check out TeeLaunch! They have hundreds of them! Plus, you can find all of these designs on other merchandise, like t-shirts and throw pillows. I also have a curated collection of other hoodies for book lovers (along with a few other random picks) over there, so check it out! 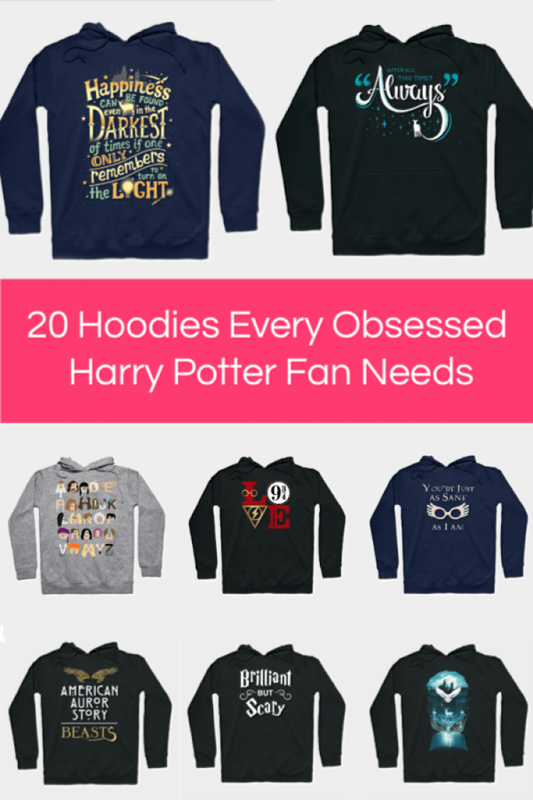 Which of these Harry Potter hoodies is your favorite?